Our idea of sustainability refers to the fact that we are all part of a large cycle. The living beings in this cycle are interdependent. This means that everyone has their role and is important for the continuity of the system. So we have to admit that even the smallest, most annoying mosquito is somehow useful and every spider has its right to exist. What we (and many others) have noticed this summer is that the number of bees and other pollinating insects seems to have decreased. 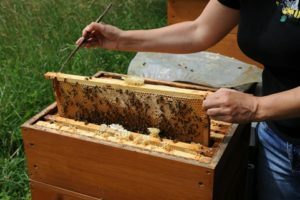 Whereas according to a "large inquiry" of the Green Party to the federal state parliament in Baden Württemberg (Germany), the number of the bee colonies is stable or even increases. Thanks to active beekeepers, whose number slowly increases with the awareness of the problems of bees. All bee species are threatened by pesticides, changes in the landscape, mites and diseases. 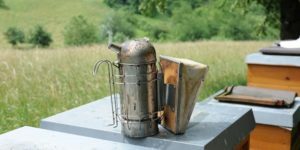 Thanks to the beekeepers in the country, these problems can be solved in the case of the honey bee. However, honey bees, as well as wild bees, are necessary for biodiversity and sufficient pollination of the plants. Why are bees so important to us in general? After all, it is easy to do without honey alone. According to the "Landesanstalt für Bienenkunde (LAB)", an institute at the University of Hohenheim in the south of Germany, the pollination of cultivated plants in Europe by bee colonies is worth approximately 65 billion euros. This means that the actual value of bees' work for all plants is unimaginably high and cannot be quantified scientifically. After a discussion over coffee about ecosystems in general and bees in particular, the idea to support the care of local bees arose in the office. So in spring, we contacted a beekeeper from nearby our headquarter for a bee sponsorship. The "sponsor" pays a more or less small amount and thus finances part of the work for a beehive. The aim is to publicize the needs of bees and to promote biodiversity in other ways. For example, by planting different meadow flowers in cities (so-called "sealed areas"). At the beginning of the sponsorship, we had the opportunity to visit the bees and meadows in the beautiful book and to take photos of them. An impressive morning! We were not only enthusiastic about Mrs. Hafner's work. Also, how calm the bees behave in and around the hive is fascinating. Even panic-stricken fellow men realize there that headless running in circles and screaming in the face of bees is not necessary :). So if you feel like getting involved, just buy a small bag of meadow flower seeds and plant them in your front garden or on the balcony. There are also bee sponsorships everywhere in Germany to make a financial contribution. The sponsorship has brought us new insights, excellent honey and lots of fun. To celebrate the 20th anniversary of the company 2016, we have started a fundraising campaign for the German non-profit association "Viva con Agua de Sankt Pauli e.V.". In the anniversary year, we set aside 5€ for each ring sold. At the end of the year, the collected contributions were donated to Viva con Agua. We are now "Supporter" since then and have contributed again last year. The association is committed to clean drinking water all over the world. For example, wells are being built in the dry regions of the world for this purpose. The aim is to provide everyone with easy access to clean water. Donations are collected by the association with different actions. Viva con Agua can be seen at concerts and festivals, for example. Here, deposit cups and bottles are collected and the proceeds from the deposit are used for our own projects. So why did we choose Viva con Agua as our anniversary project? Drinking water stands for the beginning of help for self-help in dry countries and for the end of the journey of water through the world. Our whole life revolves around it, even if it is not a conscious thought for me personally and luckily I don't have to worry about it. We are of the opinion that this should apply to all people on earth. After all, no economy can develop without water. Anyone who walks many kilometers to the nearest well every day and then has to queue for its (polluted) water for a long time cannot go to school or work. The resulting poverty once again means that labor plays a greater role than education. Without water, the development of a region towards prosperity is impossible. Viva con Agua is at the forefront in Germany when it comes to presence and training on these topics, which are important to us all. So we decided to make a small contribution through the donation in order to make more drinking water available to more people. If you are interested in the association, please read more at https://www.vivaconagua.org/. We are convinced that respect is the key to sustainable success. This respect applies to business partners, customers and nature. When I read it that way, it sounds a little bit like phrasemongering to me. In fact, however, long-term relationships with business partners can only develop if you meet at eye level. More than 20 years of Merus prove this philosophy right. Sustainable success = success that sustains. For our everyday life this also means that we do not carry out any nonsensical installations. If we believe that the interested party does not need water treatment, we will say so openly. This can be the case, for example, in areas with very soft water. We don't talk anybody into this. Every customer should decide for himself for our solution and our product. Only in this way can it live up to its expectations. We support with information and generous test phases. But never force us on. We treat our business partners fairly. Transparency and openness are important to us. After all, everyone benefits from long-term, positive partnerships - we, the partner and the customer. Experience results in expertise and ultimately in good advice. Respect for nature - quite hackneyed and difficult to implement. We are operating worldwide and often also personally on site. In general, we carefully consider the necessity of a trip. For a single appointment we do not fly around the globe and accept the CO2 emissions. Our products are all manufactured around our headquarters in Sindelfingen. This means that long transports between the production sites are not necessary. We reuse (also) old packaging material for the journey to the customer so that as little waste as possible is produced. Filling material for padding or cardboard boxes are thus used more than once. Most importantly, however, in many places we are helping to reduce the amount of chemicals that get into the water. Where Merus rings are installed in industry, less or no chemical additive is required in the water to dissolve lime or other deposits or to remove algae. In this way we contribute at least a little to environmental protection. In the next few articles I would like to present three projects that we at Merus support financially. They all have the idea of seeing us as part of the environment. Without unspoiled nature, survival is not possible for us as a company and as people. Merus is associated not only with a journey through time (90s until now), but also with journeys around the globe. This year alone, my colleagues and I have flown a total of about 80,000 km. This corresponds to a journey that extends twice around the equator. Our journey takes us to places that could hardly be more diverse. From the hull of a ship to an oil rig, from a pineapple plantation to a wastewater treatment plant. 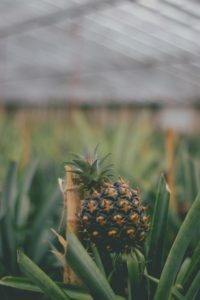 By the way, did you know how pineapple grows? I was surprised that it does not hang at all from the tree (keyword: "Pine-Apple"), but rather grows on a shrub rather near the ground. Sometimes it is the small conversations that bring the most joy. When the municipal employee thanks us for making the fountains wonderfully easy to clean thanks to Merus, we have done a good job and are happy about the success with him. Occasionally, however, there are also large projects that provide a special motivation at work. The fifth phase is only achieved after a test installation at the customer's site. Particularly skeptical interested parties can only win when a test is carried out. Suppose the Merus Ring doesn't work. Then they've "known it from the beginning" and look good. However, since the Merus Ring usually works well and large sums of money are saved, they were pioneers of the new technology and also benefit. Thus, the biggest skeptics ultimately become satisfied customers and occasionally even multipliers of our technology. What about us? We go home with the good feeling that thanks to our work a little less chemistry gets into the sea again or energy is wasted. So we like to fight many small battles and install environmentally neutral water treatment step by step. After all, the war to protect the environment is far from won. What began 20 years ago in Germany is now being continued worldwide. The Merus story is a story that has always been about finding new ways to contact customers. For us it is and was important to recognise trends, try out different media and talk and listen a lot. We learned a lot and tried a lot. Of course, not every plan you think about will work. We also had to get to know our customers bit by bit. Where direct contact via trade fairs or telephone conversations used to be important, today all information has to be prepared for the Internet. Do not assume from the own taste to that of others! At the beginning of the 2000s it was time to say goodbye to the style of the 90s. By this we mean not only flared trousers and platform shoes, but first and foremost the corporate design of Merus. That had become a bit out of date with a lot of colour and colourful pictures. So a new, "adult", classic design in elegant blue was developed. But the world was apparently not yet ready for it. That means then on multiple desire of the dealers and customers: Roll backwards, the old packagings and flyers are out again and the revolution in design is shifted backwards. ... Right. We would like to tell you a little about what is important to us and who is behind Merus. With the blog we create a platform for all our ideas, encounters, experiences, without spoiling the clarity of the homepage. So the whole project should be carried out apart from explanations and case studies, apart from business, even if both are interlinked. The writing is mainly done by me, Annika. I have been working for Merus since the end of 2014 and have completed my master's degree in a cooperative study program with Merus. I'll make that an issue at an appropriate time. My colleagues and our managing director will also contribute some texts so that different stories will be told. We are looking forward to telling you more about us and look forward to your feedback. In this sense: Have fun reading.